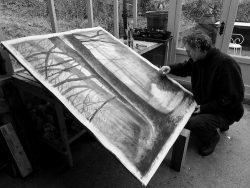 DORSET artist Gary Cook, whose focus is firmly on ecological issues, and particularly native British trees, returns to Shaftesbury Arts Centre with a new exhibition, Tree.Life running from 3rd to 9th April. This solo show features new works focusing on ancient oak trees, such as the 1,000 year old Silton oak near Gillingham, celebrating both their beauty and their importance in the environment and to the many creatures that depend on them. Some of these new watercolour, ink and charcoal artworks are 5ft x 4ft, too big for Gary’s usual studio. so he has built a new workstation in the greenhouse. Gary says: “I’ve been out in the woods with my sketchbook and a tape. By measuring the circumference of ancient oaks you can estimate their age. Some have stood for centuries, including the incredible Silton Oak, which is 1,000 years old. There will be 35 new works on show in Shaftesbury. Another two paintings have been selected for the Royal Institute of Painters in Water Colours (RI) exhibition from 3rd to 18th April in London. Other paintings are on show at Kevis House Gallery, Petworth, the RK Burt Gallery, London, and To the Fore exhibition, Frome. Gary’s reputation as a painting of trees is spreading. 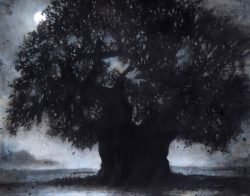 He recently won best in show in the Society of Graphic Fine Art exhibition in London and has exhibited with The Arborealists and the Royal West of England Academy. Pictured: The Silton Oak, and Gary in his greenhouse workstation. Posted in Private View on 29 March, 2019 .